TUCSON, Ariz. - After years of fear downtown Tucson was dying it's a booming place and hotels are the latest part of the boom. Now the Rio Nuevo development district is moving ahead on five hotel projects. The Rialto Theater is almost a hundred years old. Now Rio Nuevo is approving incentives to go ahead with plans to close the Rialto for about two years so hotel developers can build a new building next to it. It will offer about 250 rooms in a two-in-one hotel---109 in a Marriott Moxy Hotel designed to appeal to millenials, 149 in a Marriott Element meant for business travellers. 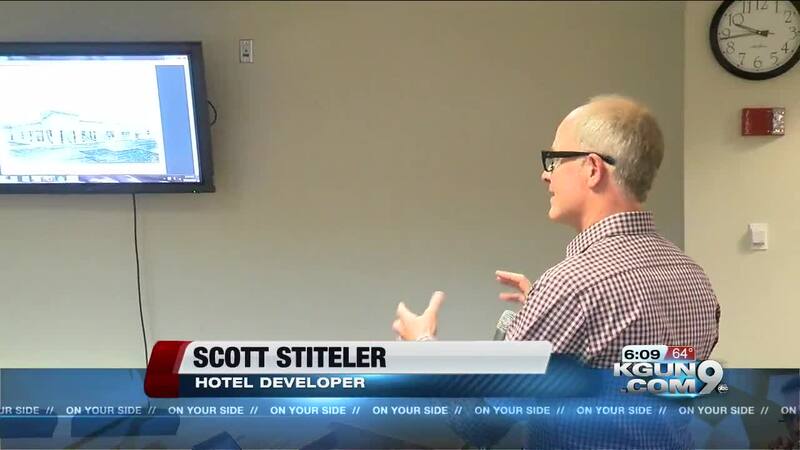 Hotel developer Scott Stiteler also developed the AC Marriott that opened across the street just a year ago. He says renovations to the Rialto will help the old theater and the new hotels work together. "Instead of having new building next to old building they will be woven together without impacting the exterior of the Rialto Theater. It will retain all of its' history and bones but there will be opportunities when you come into the new building to circulate into the theater that are quite fun." While the work's underway the Rialto's shows will go on in temporary space---the old Corbett building on 6th Avenue just north of downtown. And there is more to the downtown hotel boom. On a lot on Stone, across from the Cathedral and about a block and a half from the Tucson Convention Center a Dallas-based hotel developer is going to build a combination hotel, part Hampton Inn, part Home2 Suites. Together they'll have close to 200 rooms. And a fifth new hotel was on Rio Nuevo's agenda. The board discussed a parking garage for a new hotel planned to attach to the convention center.